Time to get stuck back into the #101drams list, and why not kick things off after a few months' break with something American? I first heard about Four Roses when reading the recipe for a Benton's Old Fashioned at PDT New York, and after trying it in the cocktail, wanted to try the various Four Roses releases on their own. It's a pretty ubiquitous Bourbon in the states, but not as common in Australia, and even less so in Hong Kong. This is their single barrel 100 proof release, tasted by way of a sample bottle from Master of Malt. Nose: Marmalade, creamed honey with a huge backbone of spice. Palate: Buttery, but surprisingly light for it's 50% ABV (100 proof). 100 proof isn't huge (not when compared with the likes of some SMWS releases or a Heartwood), but this drank more like a light 40% ABV whisky. At first anyway. 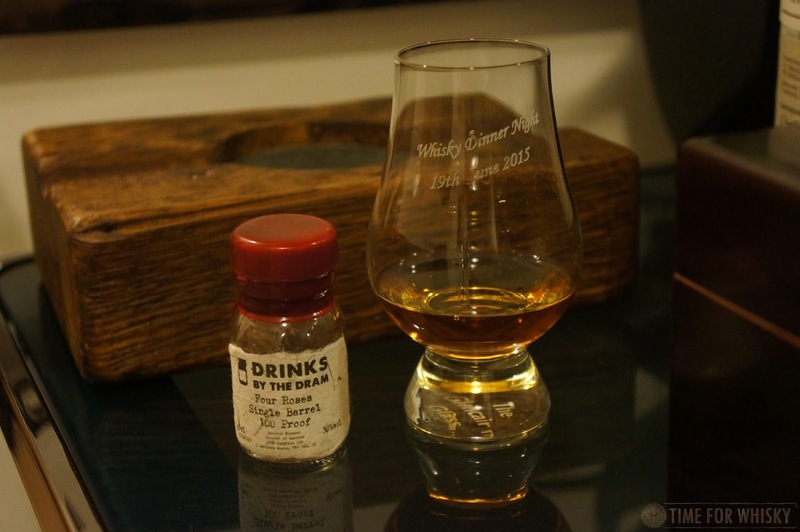 With a bit of air it opened up, and big spicy notes (I guessed a high rye content, and Google later told me this Bourbon has one of the highest rye contents of any Bourbon on the market, at 35%). Butter menthols and Werther's Originals round out a tasty, if only slightly lacking palate. Finish: Oak and a slight bitterness, with toffee notes through to the end. Rating (on my very non-scientific scale): 91/100. Very sippable, though I expected slightly more "oomph", and a bit more complexity on the palate.